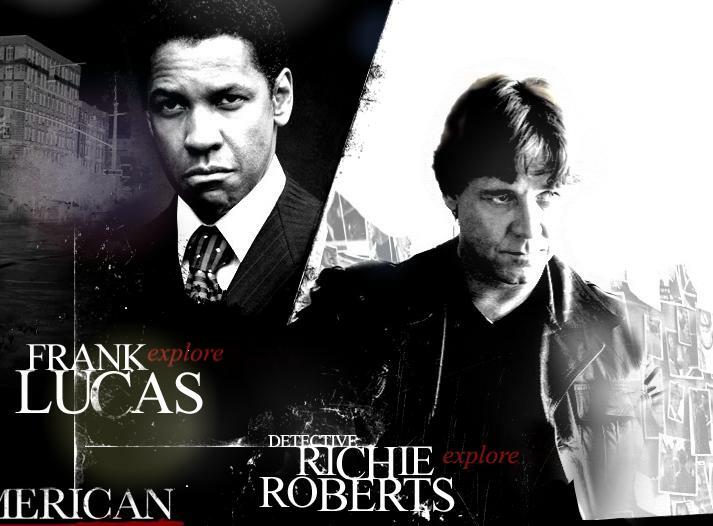 American Gangster, another movie to hit us late, two months later to be precise. It had a great opening week-end in the US and is supposedly based on a true life story of a druglord of the seventies Frank Lucas. The film’s a hit, although there is controversy surrounding the film. Frank Lucas has said that the film is only about 20 percent accurate. That would be expected because Lucas is portrayed as violent and unrepentant. The cop in the movie, Ritchie Roberts has also said the movie is inaccurate, particularly the parts where Lucas is shown as a family man. In all films which try to portray real-life events, such controversies abound, and if the director had stuck to proven facts the film would have been a documentary. I was expecting a dark, violent film, but even though the violent scenes do make one want to look away, there are other parts of the movie which are very very different. The parts about Lucas’ family, about what makes Lucas the man he is, about his wheeling and dealing. There is a lot about the cop too, Ritchie Roberts (Russell Crowe), a lot about what makes him tick, his family life, and why he is honest when all the cops around him are not. Denzel Washington plays the suave drug dealer Frank Lucas who runs the drug business during the Vietnam war. He reportedly makes a million dollars a day by not just distributing but also sourcing the drugs straight from Vietnam, cutting out middle men. He uses his own relatives to distribute. Russell Crowe does a great job as the lawyer cop Ritchie Roberts. So does Washington as Lucas. The whole story is a win-lose game between these two characters but what was realistic was that neither of the two knew who the other was, not until the end. I guess in real life there is hardly ever an actual stand-off between ‘hero’ and ‘villain’. In this movie, the police are shown groping in the dark for clues, studying a hundred suspects and the criminals are those who couldn’t care less about the actual personalities of the cops. In this film the hero, or rather anti-hero, is Frank Lucas. Most of the movie is about him and this makes us sympathise with him, makes us wish he is never caught. The director, Ridley Scott, does remind us that the man is a cold blooded murderer and a conscienceless drug dealer. He does this by showing Lucas ruthlessly killing people and by contrasting Lucas’ lavish lifestyle with that of young innocents who have fallen victim to drug abuse. Yet, we feel sympathy with Lucas. This is partly because Ritchie is not that likable or as interesting. Sure, he is honest, hardworking and committed to his job, but comes across as a bit dull. He has less screen time than Lucas in any case. An attempt is made to bring out a contrast between these two men. A ruthless killer drug dealer who is nevertheless a family man who loves his wife and mother to distraction and an honest cop who cheats on his wife. In real life people are often a bundle of contradictions and that is what perhaps the director was trying to say. Another thing I found interesting in the film was that the New York police of the early seventies are shown to be exceedingly corrupt (there are claims that this is inaccurate). Ritchie is unique because he is honest…so honest that no one wants to partner him. Having an honest reputation is something that will make all your colleagues shun you! I can’t help thinking that this is the situation in India today, where an honest cop who stands up for the truth and fights for justice is an exception rather than the rule. He is constantly punished by the system. This film was nominated for two Oscars, but it wasn’t for Best Picture or for Best Actor. It was Ruby Dee, who plays Frank Lucas’ mother, who was nominated as supporting actress and the other nomination was for Art Direction. Her performance is a poignant one and reminds us of how women, mothers and wives, can be torn between what is right and the love they have for their men. I found realism here too as both Lucas’ wife Eva (Lymari Nadal) and his mother are aware that Lucas is a criminal. They also know that he is a killer…but they turn a blind eye. This is so different from Bollywood movies, where everything is black and white. The women who hang around the villain are either dumb molls and/or evil sidekicks or innocent babes completely unaware of what the man in their life is doing. Overall, this movie is worth a watch. Not for kids though. I saw this movie when it was released here and I think Denzel Washington and Russell Crowe have done a wonderful job. There are better movies out there…but this one was definitely worth a watch. I just saw Rise of the Foot Soldier. If violence is your thing, it is a must watch. @Nita: Judging from your review, I assume it is not for you. The amount of blood and violence in this movie made me uneasy. I was having dinner at the time too! As for American Gangster, I didn’t find the movie spectacular. It was OK. It felt like I had seen the movie before. I agree with the reviews that gave We own the night a higher rating, however both would have been a half star lower with me. Did you notice the chest thumping scene? I have noticed that Denzel does that in quite a few movies. I think he does it in Training Day as well. Ruhi, agree there are better movies out there…like The Departed for instance. I loved that movie. But in 2007 I didn’t see a better crime hollywood crime thriller than this one. DD, It’s how violence is depicted which matters to me. I don’t like blood and gore unless it’s absolutely necessary. There was a war movie a couple of years ago which showed the blood deliberately as it was an anti-war movie, but otherwise there is no need to show it in your face. That’s what I think. Yes, you are right AG was not spectacular. It was very long I thought and could have been edited better. But I still preferred it to the We own the night, and I think that could be because Russell Crowe is one of my favorite actors. As for Denzil, I like him a lot too, but in this movie his acting was about average. As you said, he was typically Denzil. But overall I We own the night was too predictable for me. One can relate the leadership qualities of Lucas with that of Sen. Obama. Its funny how films that are depicting the past events can relate to the current political scenario. I liked the way the story is built up and the ending when Denzel comes outta prison as a nobody! Blood and gore — I have no issues with violence! both Lucas’ wife Eva (Lymari Nadal) and his mother are aware that Lucas is a criminal. They also know that he is a killer…but they turn a blind eye. This is so different from Bollywood movies, where everything is black and white. The women who hang around the villain are either dumb molls and/or evil sidekicks or innocent babes completely unaware of what the man in their life is doing. imagine if this would happen in mumbai !!! Balu, I liked the movie too but you missed the fun if you watched it on DVD. Prax, the movie was released last Friday!! That’s exactly 5 days ago. I wonder where you watched it though. I personally avoid pirated stuff. Besides, I love movies too much to watch them on DVD. @Nita: Rise of the foot soldier is about a guy who starts of as a leader of an English hooligan group, that goes to football matches to stir up violence. It is a true story based on his rise to a life of crime. The violence especially in the beginning half is brutal. Perhaps they could have done it with less violence, but in my perception that always creates a humane perception of the character. I usually watch movies without reading anything about them, just to have an unbaised mind. After the movie ended, I rated it just B or B-. I thought that the movie was too simple and practical. Raj, I guessed you were not much of a movie goer. DD, if that movie is very violent I would not be able to sit through it. I am quite squeamish. Priyank, I wonder how I would have seen the movie if I didn’t know it was based on a true story. I guess one’s perspective changes. I think if I hadn’t known it was a true story and there weren’t those great actors in it, I think I might have liked the movie less. Shefaly, a favorite actor tips the scale, always! Nita, I am quite squeamish myself. I turn away at the sight of blood, even when I know it is fake! But I watched it anyway, and enjoyed it. I should have counted how many times I looked away though. On second thoughts, better not to watch it. I wouldn’t suggest it for anyone with a weak stomach or during or just after dinner! Anyways, I was curious simply because where upwards of 90% of American critics thought the film was a masterpiece and the other ten percent almost exclusively fixed on the ending, many British critics were not so enthused with the effort as a whole. Often they wrote or commented that the film was in some ways a metaphor for the corruption of the “American Dream.” I personally think such talk is nonsense. It is as if the British critics couldn’t separate the film from its origin in the United States. Even the positive British reviews conformed to the respective reviewers often stereotypical idea of what an American film is and what an American film is supposed to be about. I even heard one reviewer on the BBC complain that the supposed genre of the film was a “thriller” and yet it (“No Country”) did not conform to her idea of what a good thriller is! I couldn’t believe that she was actually serious, but unfortunately she was. Here’s a question for you and anybody else willing to answer: are films often stereotyped unfairly by their origin? If a film is from Britain, France, India, or the United States, do people immediately associate a set of characteristics to the film, even if they have no prior knowledge of it? And are some cultures more or less restrictive of genre? For example, mixing genres, or being of no obvious genre, is usually good for a work’s (film, play, or novel) artistic standing (ex: “Forrest Gump”–it won the Oscar for best picture, but what was it? An epic? A war movie? A romance? All of the above, or something else entirely?) Recently, in bookstores across America, booksellers have started to further differentiate novels by putting aside a section for “literary fiction.” Literary fiction is characterized by not only NOT being one of the other genres (romance, horror, etc. ), but also by being highly realistic and essentially focused on character development rather than plot. These are the types of books that win the National Book Award and the Pulitzer. When hearing about this new trend, John Updike, one of America’s most venerable authors, sneered, “I guess I am a genre writer now.” Is this attitude culturally specific or universal? Or is it an attitude more conforming to class, with the lower classes of many cultures sharing a similar opinion and the upper classes of many cultures sharing a similarly opposite opinion? Urtead, thanks for that overview of the reviews of AG. I am not surprised that AG was rated better. I do think that people would make up their minds about films depending on their origins. And perhaps more than half of the time they would be right, in the sense an American expecting a Bollywood film to be a melodrama would be right quite a bit of the time. Only a true movie lover would evaluate each film on it’s own merit. Personally I don’t think much importance should be given to genres. the point you made about literary fiction is very interesting. I have been reading a lot on that as I am an aspiring novelist myself. And I can say that if your novel fits into a genre there is a better chance of selling it to a publisher as it guarantees a certain audience. If the novel/movie doesn’t fit, you have a lot of people who will be uncertain whether to watch it or read it. To some extent it simplifies our choices. I love reading and I love movies so I tend to see all kinds but I am a movie buff and an avid reader. But mostly people are selective. there will be people who will prefer romances for example. I too have a preference for crime thrillers as I enjoy them the most. But I enjoy other kinds of movies as well. as to whether different classes have different preferences, ofcourse! In India for example an action adventure from hollywood like superman or spiderman goes down well with the masses. A film like we own the night won’t do so well and that is why these films are released late here. Also in india due to the language problem a lot of people avoid western movies and it’s not economical to subtitle or dub them all. For example in AG even I found it difficult to understand the accent at times. Films which expect to be grossers are dubbed in regional languages here. I like Ridley scott’s movies ever since I first watched “Gladiator”. He did a good job with “American Gangster” I think it was ok among other recent gangster flicks. Though it is in no comparison with “The departed” but a good movie to watch on sunday afternoon. I don’t think “No country for old men” will be released in india any soon. I liked this movie because of its good camera work, and a great score that suites the mood of the film. I liked the performances of all of them but the ending is a bit shabby I felt like I had seen the same ending in some other movie. Its a great movie though! If you really want to keep away from violence then do not watch “the hills have eyes – part 1& 2” and “Freakshow”. American gangster in terms of violence I think its Ok.
American Gangster reminds me yet again what a versatile actor Russel Crowe is… plus it’s pretty clever how Ridley Scott makes us love the bad guy and dislike the good guy only to subtly flip that around by the end of the movie.